Designed with the same high level of quality that Technivorm brewers have become known for, the H741 offers Technivorm's most standout features at a more affordable price. Small and compact, yet with the capacity to brew ten cups, this brewer fits nicely inside any kitchen. The H741 features a filter basket that sits directly atop the brewers' glass carafe, so that minimal heat is lost as brewed coffee drops from grinds container to pot. Brew coffee at the certified golden range each time, between 196-205°F; and with the added feature of a hot plate (rather than stainless steel carafe), you know your coffee's temperature will be kept at piping hot levels. Enjoy every sip of java with Technivorm's H741, down to the very last drop of its 40oz. pot capacity. Mmm Mmm Good! Gold Certified Temperature - Brewing at temperatures between 198-205°F and holding temperatures between 176-185°F, this brewer meets the requirements of the ECBC/SCAE/SCAA (yeah, that's a lot of certifications) and is certified to create the tastiest flavors with each pot of coffee. State of the Art Brewing - Nine-hole spray head wets the grounds in the filter basket during the brew cycle. Brew cycle completes in five to six minutes. Heavy Duty Boiler - Durable copper element with dual safety guard, and automatic off functionality. Water Level - Made in the Netherlands, the Moccamaster KBG741 measures its cup sizes a little bit (1.75 oz.) smaller than the US standard cup of coffee. Tipsy! - The H741 filter basket sits directly over of the carafe. Careful not to knock it over! No Internal Clock - Many modern coffee machines come with internal clocks that will brew coffee for you in the morning - but often that also means having to leave your ground coffee out overnight too! It may be less convenient to take these steps in the morning when you wake up, but the taste of your morning coffee will outshine the process. 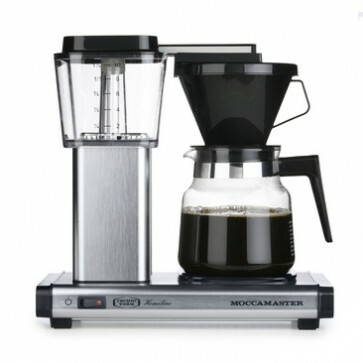 The Technivorm H741 is uniquely designed so that the grinds-container sits directly on the carafe. This means that, unlike most Moccamasters, this model doesn't come with (and wouldn't have space for) a brew-through lid. It does however come with a serving lid. Other Technivorms offer unique functions such as hot-plate temperature settings, or the ability to brew half a pot at a time. Technivorm also makes machines that accommodate a preference for coffee makers to use stainless steel carafes, to avoid accidentally burning coffee over time. In the end, it all comes down to what you like! Crew Review: Technivorm H741 / K741 - Redux!